It is possible??? Can it BE??? Or is it JUST a COINCIDENCE??? Monday Montage is turning 50, amazingly enough, on the SAME week in which I will turn 50, er, um ... 27 (again!)! I have had so much fun participating in this blog hop with these amazing ladies ... and consider each and every one of them a true-blue friend!! This week I'm playing with a set called "Pretty Thankful". I think it is kind of an easy one to overlook in the catalog because it's not really "over the top" ... but I think it's freakin' ADORABLE!! 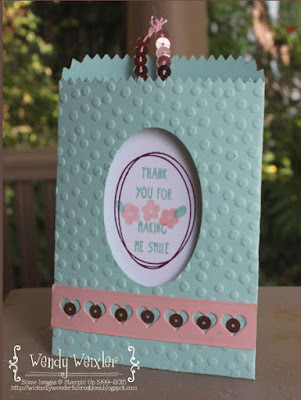 I made this one for a recent swap I did with my Control Freak friends (yeah ... we do organized swaps SEVERAL times a year ... and their work is ALWAYS awesome!)!! And here's another one I did with my stamp club a couple of weeks ago ... I LOVE the idea of making a "pocket" card with the Mini Treat Bag thinlits. SOOOO cute!! I had the privilege of being invited to a "Princess Tea Party" for one of the sweetest little girls EVER (Happy Birthday again, Caroline!)!! Since the girls were ALL dressed up as princesses, I decided that I HAD to join in the fun!! 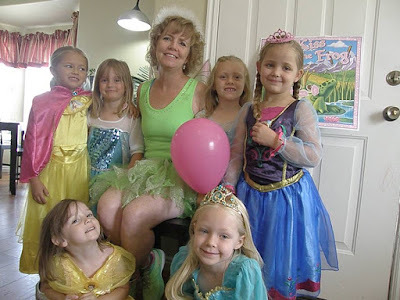 As I walked to the door of the party a GAGGLE or darling little girl princesses came flooding out to greet me!!! Tinkerbell ME: "Why, yes I am!" Little Princess #2: "I saw you on tv!" Little Princess #3: "Can you fly?" Tinkerbell ME: "Yes, yes I can!" Little Princess #3: "Will you SHOW us how you fly??" Tinkerbell ME: "I would, except I left my Pixie Dust at home!" It was GREAT!!! I'm STILL smiling!!! Thanks, Elisabeth, for allowing me to share such a special day with those princesses!! And guess what else???? I'm headed "home" ... since I AM Tinkerbell ... and it IS my birthday this week!!! Happiest Place on EARTH, baby!! Click "Back" for Melissa Stout and "Next" for Amy O'Neill ... genius stamping from BOTH of them!! Rain, rain, rain ... oh how we NEED a LOT of RAIN!!! Even though we are two states away from the devastating wildfires in California and Washington, the skies in Salt Lake City are heavy and dark. The mountains are nearly IMPOSSIBLE to see ... and my eyes are red and weepy (like so many people right now!)!!! It's Fab Friday and I decided I needed some FLOWERS to brighten up the dreary skies!! 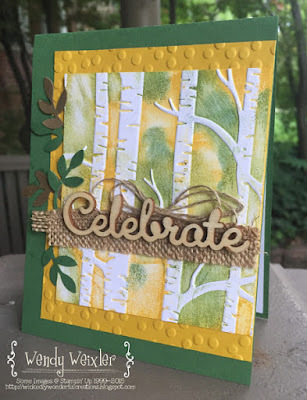 I haven't used more than two stamp sets on a card in quite a while ... three different sets this time!!! I tried to do a little bit of a different layout this time around ... I seem to have been stuck doing the same thing for a while now, so I'm at least TRYING to shake it up a little bit! Tomorrow I am dressing up as Tinkerbell ... yeah, I REALLY am!!! It's time for a little girl's birthday princess tea party ... so now I have an excuse to dress up!!! Ohhhh ... ALL the goodness!!! Holy COW!!! I have FINALLY had a chance to play with my new Holiday Catalog "preview" goodies!!! 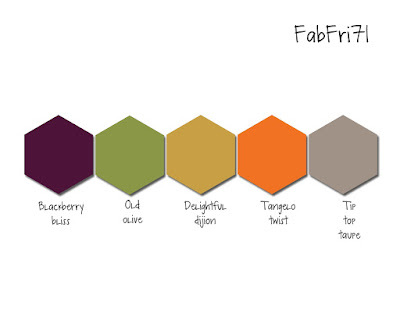 To be honest, I am having a HARD time wrapping my brain around doing any sort of "fall" creations. But, since it it is my absoLUTE favorite time of the year, it really didn't take me too long to get into the groove. And I am happy to report that my BFF Jan Tinklenberg has joined the ranks of the Control Freaks once again!!! (Did you SEE what she MADE???) Choirs of angels sing (or at least I DO!) to have her back amongst us once again! I hate to even ADMIT that I have felt a TEENY-TINY bit of fall in the air ... not very much, mind you, but the evenings HAVE been cooler (as well as the mornings) by at least a few degrees!!! I cannot WAIT for the seasons to change, though ... running through the canyon in the cool temperatures with the colors and SMELLS of fall??? Just about as close to a slice of HEAVEN as you can GET! 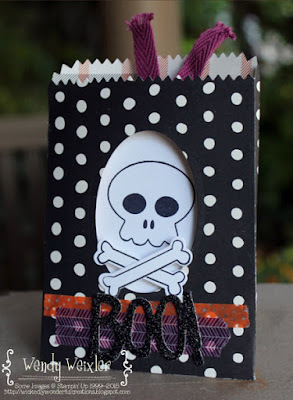 So this is actually a CARD and not a TREAT bag! Just pull on the little ribbon at the top and the card inside is blank except for the skelly face (that's what my daughter calls skeletons ... and it has kind of grown on me!)! The little bones are attached to the outside front of the "treat bag" .. stinkin' cute, right??? Next up?? The delightful Debbie Henderson! It is even super fun for ME to see what my fellow freaky friends come up with ... they NEVER cease to AMAZE me!! The Stamp Review Crew is at it again!!! This week we are "reviewing" Stampin' Up's Awesomely Artistic set. I have already used this thing SO much!!! The images are ALL just GORGEOUS! I did the background bricks with a technique I learned long ago and far away ... 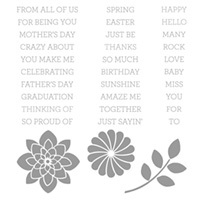 I inked up the embossing folder with some Whisper White ink (actually on the "negative" side so that the bricks would turn white and not the "grout" between the bricks ... hope that makes sense!). 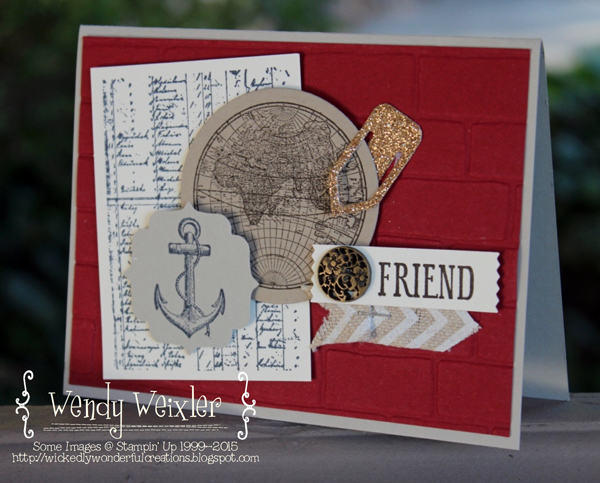 I ran a piece of Cherry Cobbler cardstock through my Big Shot with the inked up embossing folder. 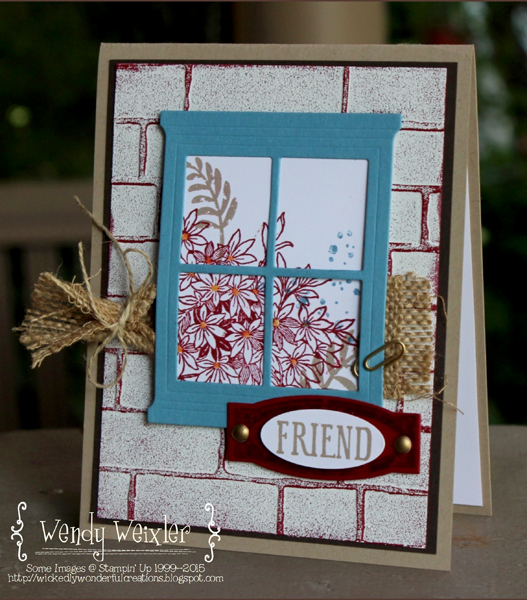 Then, I sprinkled some Whisper White embossing powder on the ink and heat set it. Ta-DAAAA!! Yeah ... this is the SAME card ... I decided after I took the photo of my first version that the flowers might benefit from a little bit more color ... so I added a little splash of Soft Sky to the flower petals. I still can't decide which version I like better ... what do you think?? You KNOW you want one of these sets, don't you???!!?? 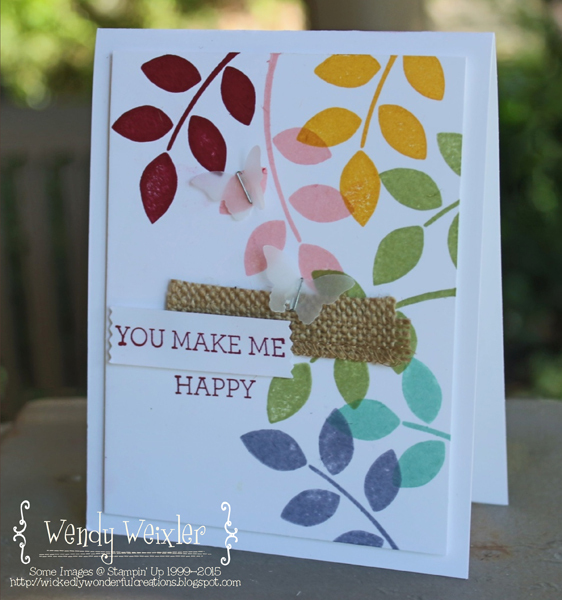 The "previous" button with take you to Stampin' Seasons with Linda Callahan ... and the "next" button with show you what Jen Timko created on her Stampin' on the Fly blog!!! You know who your TRUE friends are when they can see you through the Good, the Bad and the Ugly ... and will talk to you and NOT judge when you LOOK like the Good, the Bad, and the Ugly!!! I am reminded, once again, how large my "safety net" of friends is as my mom has been back in the hospital (all is well ... she is currently in a rehab facility for a few weeks, but makes more improvements every day!)! And yeah ... this is a DUDE "friend" card ... and I have DO have some DUDE friends as well. But I have to admit that there is nothing like a GIRL friend to share your secrets with! It is the BEST!! 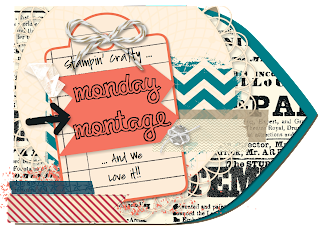 Welcome to another Monday Montage! 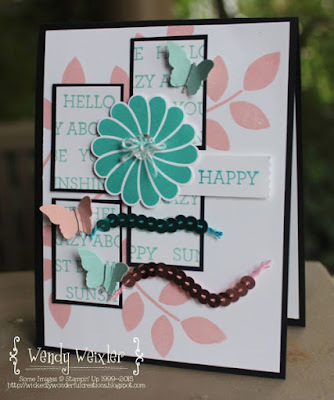 I have had so much FUN playing the last few days with my stamps and paper! Yesterday I had my stamp club girls over and we had a great time!! 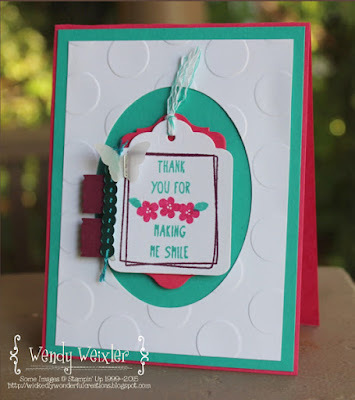 Today I'm sharing one of the cards we made when we were all together. I actually saw something similar to this somewhere on Pinterest (I wish I could remember where!). Click "Back" for Melissa Stout and "Next" for Amy O'Neill ... ALWAYS inspired by what they come up with! Hey, peeps!!! I love summer ... and we are already working our way through the LAST month of summer! 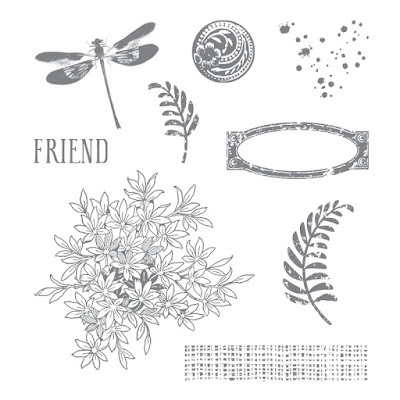 I just received my preorder goodies from the Stampin' Up Holiday Catalog. 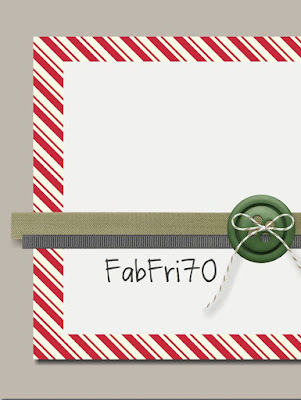 I canNOT wrap my brain around "fall" and "Christmas" creations ... but this embossing folder was just CALLING and CALLING to me ... so I was happy to have the Fab Friday Challenge to get me going! I love aspens. We call them "quakies" in my neck of the woods. 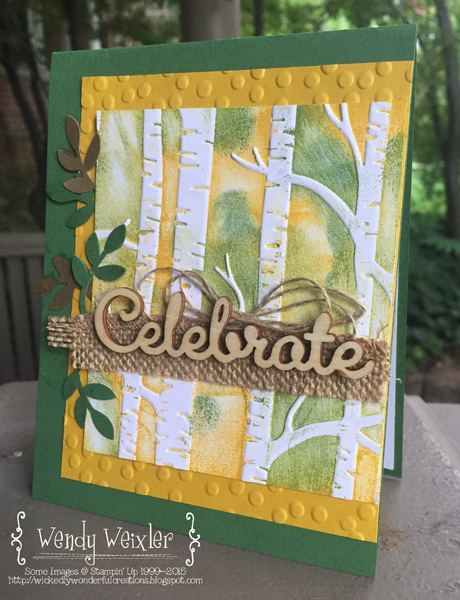 I realize the trees in this embossing folder are supposed to be BIRCH trees, but I look at them and see quakies ... hence, this card! We used the sketch from one of the card samples on the front of the Holiday Catalog ... you guys are gonna LOVE the stuff in there!!! I just need to endorse my paychecks over to Stampin' Up for the next little while! I am excited to have my stamp club girls over on Saturday ... and I have a family baby shower on Saturday as well. The weekend will be over before I know it! FINALLY!!! I get to participate in with the Stamp Review Crew again!! I have had such a crazy summer ... and every dang time I COULD participate, they were using a stamp set I did NOT own (which is hard to believe, since I feel like I have just about EVERYthing!)!! This week we are playing with "Crazy About You". Not ONLY does this set have a plethora (good word, right??) of sentiment options, it also has a couple of AWESOME flowers - that have matching punches - and a really nice leafy branchy image, too!! Had a very busy but great weekend!! I still need to get my stamp room/crafty space cleaned up from Convention ... it's about time I do it, too, because I can't seem to find ANYthing!!! Seriously ... you NEED this set if you don't already have it, right???? There's a whole month left of summer, and I have done ALL the crazy things that I HAD to do!!! I think I need to find something ELSE to do ... oh wait ... I'm making a trip to the Happiest Place on Earth at the end of the month for my birthday!!! THAT will be awesome!! Up next?? 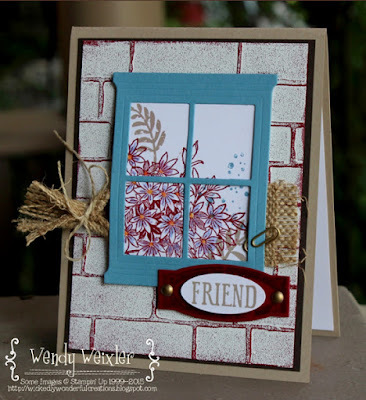 Nancy Smith has a GORGEOUS rustic-looking creation ... and on the previous link you will see Jessica Williams and all the colors of the rainbow!!! SUCH fun! !